Same error message was thrown when I tried to install the latest drivers from Intel directly. I even tried to install the drivers manually, but this didn't work either. Now I would like to know whether it is even possible to get the Intel Iris Pro graphics card running on a MacBook under Windows and then switch between them to increase battery life when I don't need high graphics peformance. I am using the Mavericks version of BootCamp assistant and have the retina model. I know this is not the answer you want to hear, but unfortunately there is no way to disable the discrete GPU and use the integrated graphics, when using Bootcamp. This has been discussed (to death) on support forums and on the web generally. I have thought myself in the past, that it would be useful to be able to turn off the discrete GPU just to improve battery life on the laptop. But Apple have not provided a driver capable of switching off the discrete GPU, so there is no way of doing it. Sorry to be the bringer of bad news - who knows, maybe they will provide that functionality in the future? Whilst possible with Windows 8, it's not a task for the faint hearted. It's not that you can't disable the GPU, you can, I have to do it because my graphics card is failing (2011 iMac). It's that there is no other option but the default graphics driver provided by Windows (VGASave). 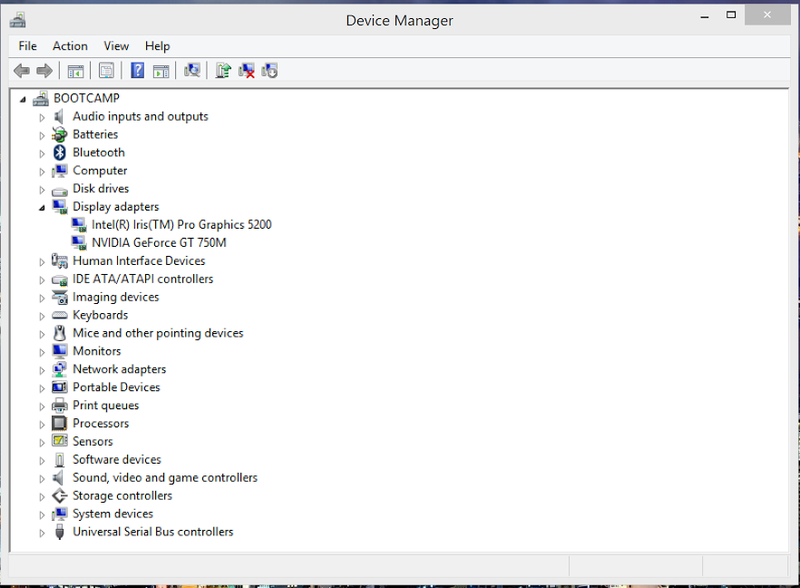 I would be fine with that option but VGAsave only has a few resolutions, and it stretches them to fit your screen. Again I have used it for a while without the stretching (just has black bars) and it is a thousand times better than VGAsave. I'm sure it would not be overly difficult to implement a non-stretched alternative. I know it's hard to think of Apple's philosophy being bad, especially since it is the same philosophy that has bought so many good things. But it's obviously because they want you to have the best performance all the time. And if you can't get that then you need to get a new machine. Even thought it's a rather old thread, it's still one of the first that come up if you are searching for I-Gpu and MacBook Pro. What you are basically doing, is spoofing the system thinking that you are booting on MacOS while you are booting on windows. It seems that it's mostly an issue on people that are interested on using an egpu on windows, but it was also a problem for anyone that doesn't work the battery to last for like 2-3 hours when using windows because of the dedicated gpu running all the time. I have successfully installed it on my computer and is working without any problems. Not the answer you're looking for? Browse other questions tagged macbook windows bootcamp gpu .